How much does a Refrigerator Repair Cost? The average refrigerator repair averages about $125, but it all depends on exactly what is wrong with your refrigerator. Our appliance repair service tries to ascertain the problem before we come to your home. Honestly, there have been more of than a handful of times that we've just told you that you need a new fridge. Give us a call today (203) 779-6815, and we'll diagnose the refrigerator problem over the phone. My refrigerator light is broken, is that fixable? Refrigerator lights are often fixable. Certain refrigerator models such as GE, Wolf, LG and Subzero have more complicated light fixtures. 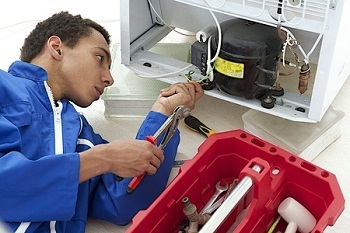 Our refrigerator repair pros will be happy to diagnose your broken fridge light problem over the phone. We want to make sure we can fix your refrigerator before we drive to your Danbury or Ridgefield home. Do you always recommend Fixing Refrigerators? If we have other repair questions not mentioned on the FAQ can we call you? Do you do Refrigerator Repairs in just Danbury, or Ridgefield and New Fairfield too? Our home appliance repair service offers refrigerator repair in not only Danbury, but Ridgefield, New Fairfield, Bethel, and Brewster. We even have fellow repairmen that do Refrigerator Repair Huntington NY! We believe that the whole Greater Danbury area should have access to professional, affordable, and honest appliance repair service. In the past we've only served the City of Danbury, but due to a increasing number of calls from Ridgefield, CT we've expanded our service area. Our service area now includes more than just Danbury, and we get a ton of people thanking us for our professional service from as far away as Brookfield or New Milford, CT. Whether you're looking for fix your broken refrigerator, busted dishwasher or overflowing washing machine give us a call today (203) 779-6815. Do you Repair Subzero or Wolf Refrigerators? Our appliance repairmen absolutely repair subzero and wolf refrigerators. Sub zero is one of the most popular brands of refrigerators. Most of the calls from Ridgefield stem from Sub zero refrigerator repairs. Wolf is another popular brand in the Danbury and Ridgefield areas of Connecticut. Wolf refrigerators aren't an easy repair, but our appliance repair service can definitely handle them. If you need the best subzero or wolf appliance repair service in Connecticut than definitely give us a call. We don't service all of CT, but we certainly will take care of repairs in Danbury, Ridgefield, New Fairfield and Brookfield. Our home appliance repair service is just a phone call away.